Cliff top view of An Bhuideal from the South with Tormore Island in the background. An Buideal close up from the surrounding cliff tops. An Bhuideal and Toralaydan Island from the summit of Cnoc na Mara. An Bhuideal from the north. An Bhuideal taken at sunset from approx a KM out to sea. A climbers Topo of An Bhuideal sea stack. An Bhuideal sits approx 1.5KM North of An Port and is quite simply an Iconic sea stack. It's twin summits provide rock climbs that have few equals in the country. It is easily an equal to the much better known Old Man of Stoer off the coast of North West Scotland. Access is by a steep exposed scramble down the huge ridge on the headland to the North of the stack followed by a 30m abseil to a superb storm beach facing the beast from the north. A 300m paddle from here along the land ward edge of a series of outlaying skerries will take you to the base of the land ward face of the stack. 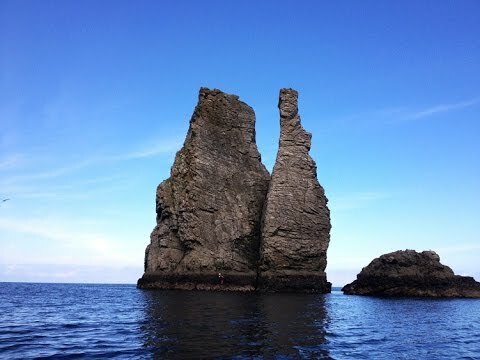 More route details are in the Donegal Sea Stack Guidebook. The main tower is the thicker Southern one and contains two excellent Severe rock climbs to it's summit. There is a quad rigged belay station on it's summit allowing an abseil down the centre of the land ward face. 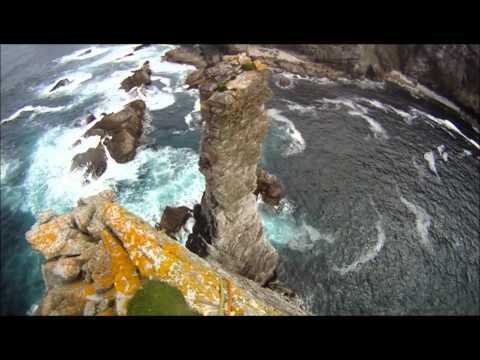 The slender North tower, which lookes like an old fashioned milk Bottle from the sea, provides one of the most exposed and scary rock climbs in Ireland. At the amenable grade of VS this route winds it's way up the land ward and North faces to a tiny sloping summit. The summit feels like it sways slightly as you sit on it. The abseil off this summit is not for the faint hearted as it is incredibly exposed and relies on a summit cairn as the primary anchor. A truly outstanding adventurous day out. Access Difficulty:Can be very emotional indeed.